CBS News, led by its chairman Jeff Fager (left), was quick to correct when it misidentified the Navy Yard shooter, but intransigent when dealing with errors regarding Israel. What's up with that? CNN's "10 Things to know before visiting Israel, the West Bank and Gaza" by Matthew Teller, meant to promote a broadcast featuring author and chef Anthony Bourdain, is chock full of factual errors and distortions. A lopsided AFP timeline outlining 20 years since the Oslo Accords recounts Israel's counter-terrorism actions while completely ignoring the Palestinian violence that prompted them. 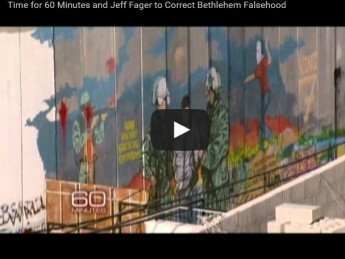 A CAMERA video calls on CBS News Exec Jeff Fager to follow his own advice and correct errors in a notorious segment about Christians in the Holy Land. Ha'aretz's English print edition tidies up "Land Day" events, deleting the Hebrew edition's detailed coverage of Palestinian stone-throwing and the resulting injuries of a toddler and soldiers. 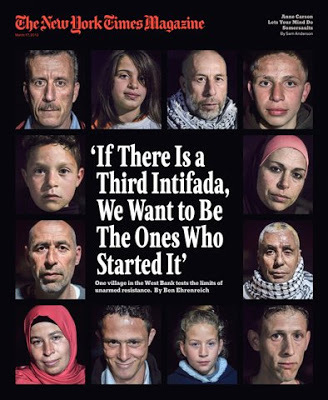 Painting a sympathetic portrait of violent demonstrators, The New York Times Magazine 8,000-word cover story asks “Is This Where the Third Intifada Will Start?” With all the cheerleading in the article, it seems the New York Times hopes so. Weeks after Ha'aretz published, and then corrected, the wildly inaccurate front-page apartheid poll article, the English edition runs an egregiously mislabeled map and a tendentious headline. Where are the editors? The Diyar Consortium led by Lutheran Pastor Mitri Raheb (left), falsely describes the security barrier as encircling Bethlehem. Bishara Awad, president of the Bethlehem Bible College, falsely reported that the security barrier “goes all around Bethlehem” in a fundraising video for the school. Bob Simon had the time, but apparently not the inclination, to investigate the challenges faced by Palestinian Christians. Consequently, he misled his viewers about this community in a recent episode of 60 Minutes.